I really enjoyed the webinar on sign language! I’m looking forward to more webinars from you. You are a great mentor!!! Thank you for what you’re doing for all Santa’s!! I was very happy that I could attend and participate in the ASL webinar you and Kat conducted. It was just so informative and fun to boot. I almost didn’t make it due to being exhausted from a days work. I actually had passed out earlier that evening for about 20 minutes which was apparently enough to reboot. Thank You so much for holding these informative and very worthwhile sessions. Thank you Santa Ed for all you have done in this training program and future programs that we hope to be a part of this next year. I recently watched a PBS program about people that live a well lived life for themselves, by improving and enriching the life of others. Those people featured in that TV program, left a legacy that few can equal. You have certainly have done that with your training and advice. I have witnessed a “Legacy” in the making! My wife and I are so happy we selected your training program and became a small part of the “Santa Ed Taylor Legacy”. As we approach the Christmas season later this year, I only hope that I can live up to the wonderful training I received. 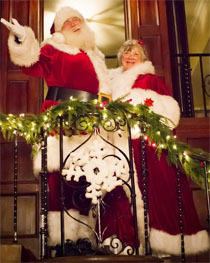 “I appreciate the method of delivery of The Santa Claus Conservatory classes and bonus sessions. 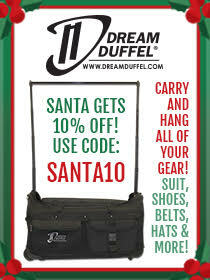 A lot of Santas do not have the time and or the money to travel to a fixed site Santa School. The Santa Claus Conservatory brings those barriers down. You study in the comfort of your own home, at your own pace, and can review when ever you want. 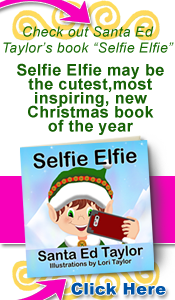 The Content of the training will help you to become an Extraordinary Santa Claus portrayer. No matter if you are just starting out, or have decades of experience, you will find something that will hit you as an “ah ha” moment. Thank you so much for putting together such an interesting and information packed class this evening. I appreciate your servant heart and wiliness to share in this way. I had to punch out a little after 7:00 we had a T Storm roll through and I lost my connection. I will pick up the ending when I watch the video again thanks. Have a great week. Also, the individual Santa’s information. Thank you so much for your insight into this subject.” Santa David Nelson “Much more detailed information was presented tonight. Really helpful information on creating a website and getting good Google ratings. Best presentation yet.” Santa Nana Posted to a private group of Santa’s I rarely post much and I almost NEVER endorse anything, but I think this will be helpful to some, so here goes. I spent my life believing the best thing a man can share in his life is his knowledge and Santa Ed does a great job of that. I didn’t post anything yesterday because I was implementing what I learned Thursday during Ed’s session. 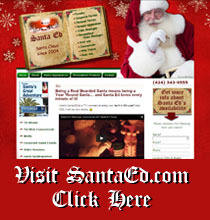 I was fortunate enough to attend Santa Ed’s online Santa school. For any of you who are considering it I would like to say, DO IT, it is a great investment of your time and money. The online course is perfect for me, it can’t be more convenient plus you get a video you can go back to any time, I love it, I’m not a good note taker :-). Having the opportunity to reach out to Santa Ed as a mentor and receive honest answers is simply outstanding in my way of thinking. I could write about all the things he spoke of but I would rather mention something he gave me that was not in the course. CONFIDENCE!!!!! He gave me the confidence I needed to move forward knowing I am doing the right things. Santa Ed, Thanks so much for the great Santa business advice, tonight. Really enjoyed the session and see much value in each of the classes that you will make available in March, April, and May.I took your classes last year and highly recommend them and you. Ed, thanks a lot. I enjoyed your class. I thought I knew it all, but your class let me know I’ve still got a lot to learn. Santa Ed, Your webinar tonight was very well done and you managed to stay on topic very well. Your outline was very concise and I picked up several good tips. I have followed your advice and Larry Hersberger at Kissing Tree Studio is helping me create a new website for cliffkringle.com and we will be adding an online store for all of the products I have for sale. Speaking of Larry, thank you again for the wonderful plug you gave him and me during the webinar. I really appreciate it, and I will be sure to tell him as well. You did a great job and I am glad I signed in tonight. Ed, Thank you for another fine presentation. 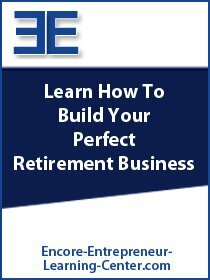 As you recall I participated in your webinar series last Spring and got so much out of them that really helped me during the past year and holiday season. Again tonight, though time restricted for each topic, I picked up several new ideas and bits of information for my Santa business.And I am one who knows first-hand how you will expand each of the topics in your upcoming 2015 webinars. As always, I look forward to continued relations and necessary counselings with you. Thank you. I feel I picked up some useful ideas. I have been doing this for two seasons now. I am a part of the group called Lone Star Santas here in Texas. I personally am located in Fort Worth. Thank you for your enthusiastic example as well as encouragement to be myself. I have had a great time with kids, both young and old. Hello Santa Ed Thank you for providing this type of learning format. I sat in on this evenings session and found it informative and motivating. I will be looking forward to working with you this coming season. I will be looking forward to meeting you in person sometime in the future. Hello Santa Ed, Thank you for your seminar this evening. I was interested to see what you had to offer as Santa and whether or not your classes would be worth the time and money! 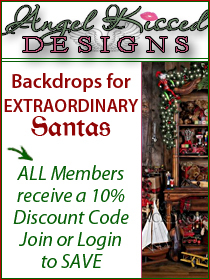 I believe they would and would encourage other Santa’s to look at the classes you offer. I think some would be more helpful to me than others so it is nice to be able to pick and choose. Santa Ed, This Santa Mike Lawson from Culpeper, VA. I am a year-round, real bearded and real bellied Santa and have been now for about 8 years. Also, thank you for all you and our other brother Santa’s do on a daily basis! I firmly believe in the troubled time we live in, people look to us as one of the things that can bring a smile and warmth to their day. Ed, the webinar last night was invaluable beyond belief.Your internet marketing expertise was most evident. I’ve been to other Santa schools but yours went well beyond the typical Santa 101 class. You were definitely functioning at the graduate level! Thanks for sharing your expertise with us. I thought you did a great presentation and once I enlarged you on the monitor it was like I was sitting in the chair across from Santa!! Great topicsthat I needed to know since I am just getting started as Santa. Thanks for inviting me! Hi Santa Ed Taylor, I was one of the Lucky one’s got in. I found the information very useful.I even saw areas that I need to work on. Thank you for opening my eyes to some new ideas. 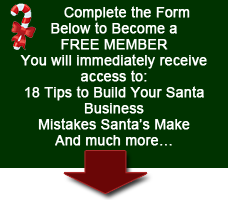 As an attendee last night of your webinar “18 Free Tips for Improving Your Santa Business in 2015”, which introduced your new nine-class series coming in March, April, and May 2015, I must tell you how impressed I was with both the subject matter and your professionalism and business acumen. 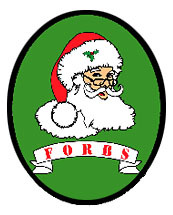 Even though I have owned and operated several businesses for over 40 years; I am looking forward to participating in this series, as the topics you plan to cover provide all the essential tools and information a Santa needs to run a real business. The nine-class series will be of tremendous benefit for anyone who wants to be a better Santa, build his customer base, and develop their very own business of being a Professional Santa. I also have decades of experience as a Santa, and during such time have attended other Santa schools, classes, and webinars and I can tell you that your webinar tonight introducing your upcoming series, clearly convinced me that you will be offering something that no other Santa course has been able to address so well to date. If I can be of any assistance, please let me know. I would invite and encourage anyone “sitting on the fence” and trying to decide to take your course to call me. I am more than happy to personally recommend your course to any Santa who wishes to see, understand, and achieve the “big picture”. 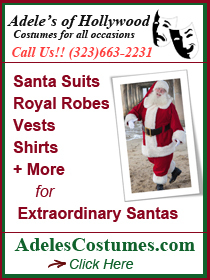 of having a successful and profitable professional Santa business. I love the way Santa Ed compresses so much important information into such a compressed time period of time. Ed, I thought your webinar was terrific. It provided comprehensive nuts and bolts information not found in other similar webinars I’ve attended. It will guide my continued Santa professional development for years to come. As you know, we just completed our fourth session of this spring’s nine evenings online. At first I had been debating which Santa School to attend of the many awesome schools. They all meant much travel, and in order to really get the most out of them, to be able to dress like Santa, and also have some experiences to discuss with all of the other Santas. I am new, just starting out. I have no suit, no whisker set, and no experiences to share. What I needed and found in The Santa Claus Conservatory, was training I could take from my home, in any weather, in the comfort of my office. No nerves or anxiety, or even costume envy to deal with, just good solid, practical information on becoming an extraordinary Santa. Our live webinars are two-way interactive with you and other Santas in attendance and are as much fun as they are informative. I sit with windows notepad open on my desktop, and type notes as we go and even take screen shots of special slides I want to remember for my files. The fact that we are sent links to videos of all past sessions, makes for great opportunities to review later …. I want every Santa who reads this to know you have never once asked me or the other Santas to post reviews of the webinars. They come back to you because you deliver solid, basic concepts,and data that we all need to get started and to continue successfully in this business of portraying Santa. … After much deliberation and consultation with my wife and friends, I decided on this Santa path for the rest of my days. … I will also attend ‘in person’ schools for fun and further information, but I hope that you continue to have the time and energy to offer Conservatory classes, online, to keep me on the right track for years to come. You build the courses and I will come. And so should every other Santa who wants to be ‘Extraordinary’! Wow, what a lot of great information in your 9 classes. Being a first year Santa, these courses will help me to become an extraordinary Santa. I know I will not remember everything, but I can do reviews of the classes when needed, and review my notes too. Please keep up the great work.